One of our must-stops while in Helsinki was the Johanna Gullichsen design studio. 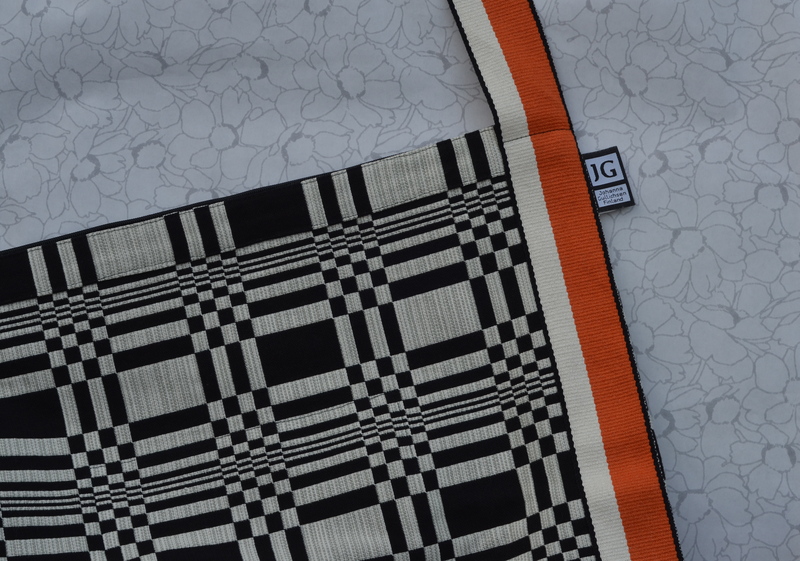 Located in the Helsinki Design District, (they have another store in Paris), the storefront features table linens, bags, and pillow covers made out of the artist’s bold and geometric woven textiles. The second room contains bolts and bolts of her wonderful fabrics. They are available for purchase for furniture upholstery and there were several chairs in the studio covered in them. While we were there, the designer was in consultation with a client so we did not get an opportunity to speak with her. Nonetheless, we did revel in the various textiles. 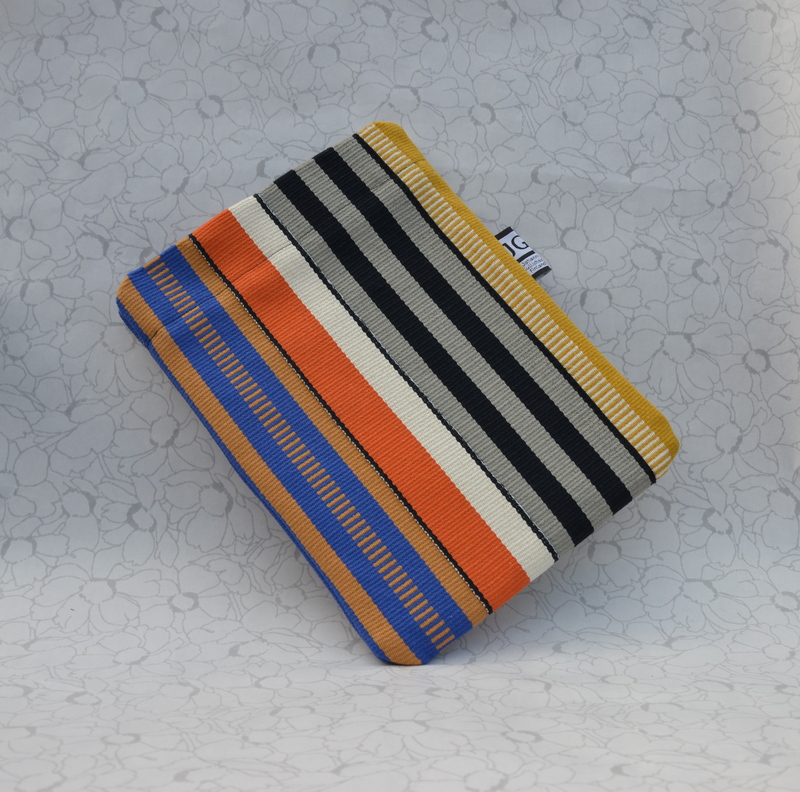 The bold geometric design of this bag caught my attention. I love the way the pattern gives the illusion of rolling waves, like looking at a mirage of water on a hot pavement. The bag is large with a nice wide bottom and can be worn over the shoulder or cross-body. 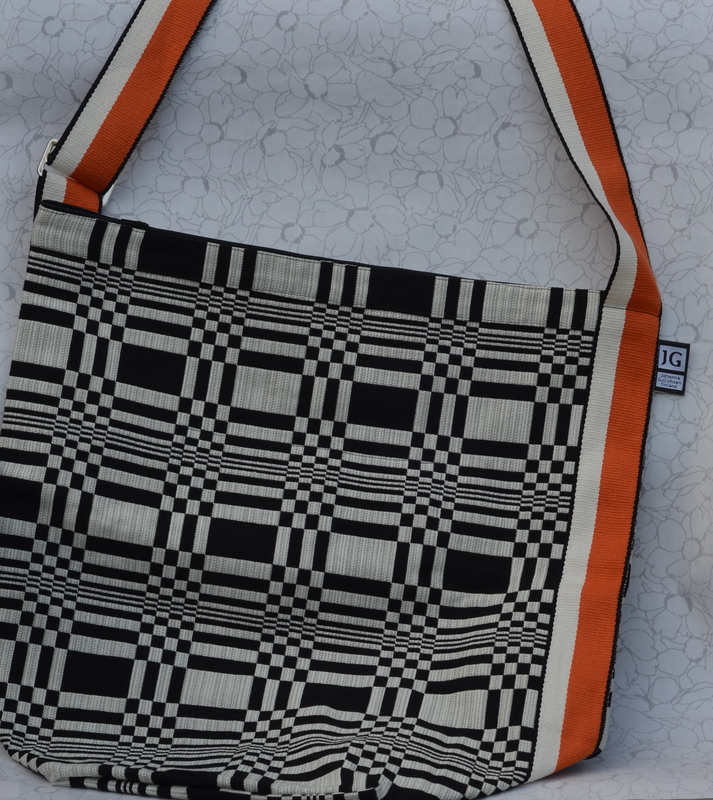 Tetra sack in Doris black fabric with orange strap, 100% cotton. The Doris pattern is also available in blue and bordeaux. Tetra sack close-up of geometric pattern. 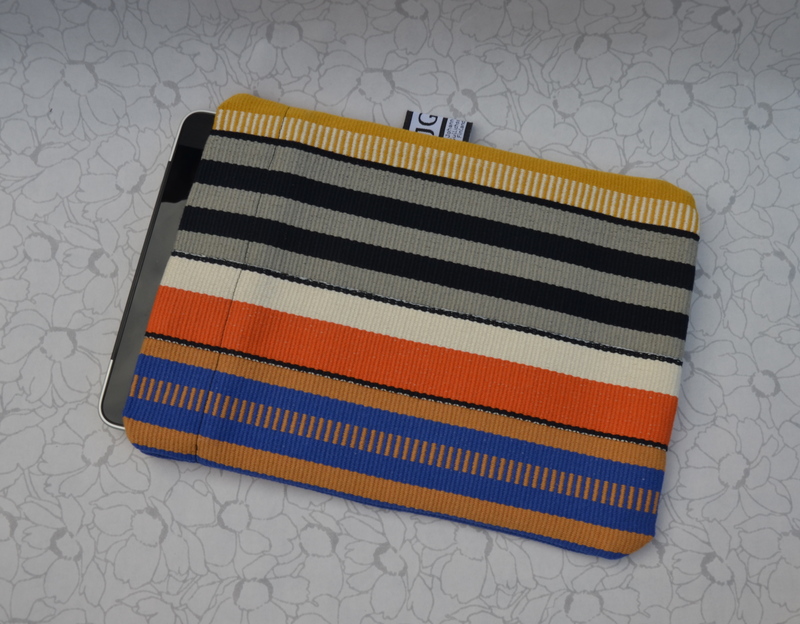 The iPad sleeve was a relatively new product. The colors were particularly attractive and the simple row design keeps it balanced. The sleeve has an inner fabric fold and a velcro closure to keep the iPad safely tucked inside. iPad sleeve with iPad inside (not included). We picked up a few of these catch-all bags for cosmetics or to corral chords for electronic devices. 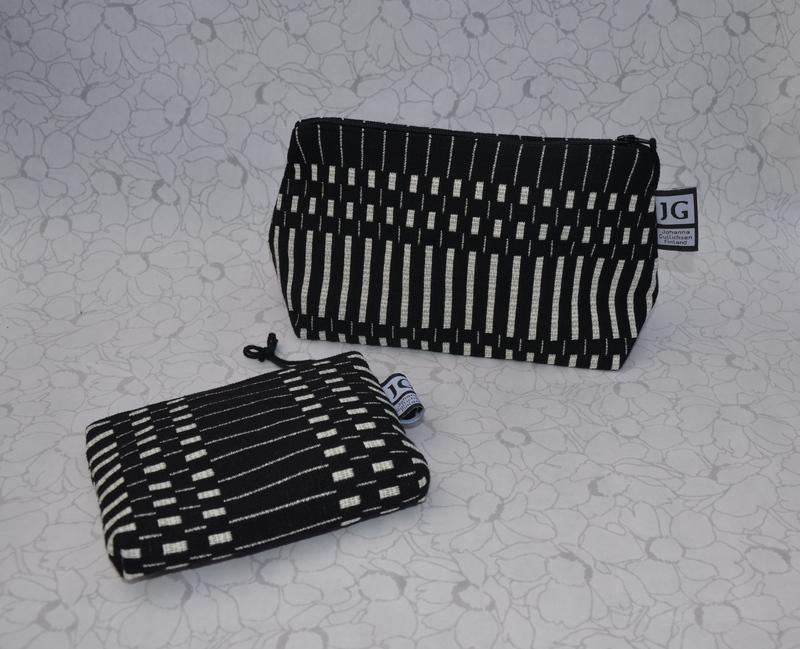 Small bags in Nereus black fabric, 100% cotton. The Nereus fabric is also available in blue and bordeaux. For more about Johanna Gullichsen, read her biography on her website. also we imagine you write again soon!